A close up of this Costa Rican native's flowers. Photo taken Nov. 29, 2011. I really like this one Delonix.....the more pictures you post the more I like it. That's gorgeous, Delonix...how hardy is it? Not sure. It native to tropical Costa Rica. I know people in San Diego grow them...and they bloom all year. Lovely shot and what a smashing colour. Lucky you! Mine was ripped to shread by hungry wallabies! It's coming back slowly, but of course I haven't seen any blooms for ages now. My vine has been a lot more vigorous than I wanted, hopefully it'll slow down. It's bloomed consistently as long as I've had it, however, it's not super floriferous! I'm hoping to get mine into the ground, once the pergola has been re-constructed. Hopefully it will climb up over the pergola and finally put on a display of blooms. It should cover your pergola in no time at all. Mine was put into the ground around mid-July and has covered the side laths on my shade structure. I may possibly allow it to crawl up to the roof laths...I'm just hoping it won't attract too many bugs! That's great to hear, Andy. I was just heart-broken when we had to chop down the Jasmine and the Hibiscus schizopetalus to stumps in order for the old pergola to be removed. It will take some time for them to reach the size they were, and I'll be able to add some more plants once the whole structure has been re-constructed. Hopefully the Dalechampia will take off as quickly as you say it can. Others in California are having the same very quick-growing results with Purple Wings vine, as me. 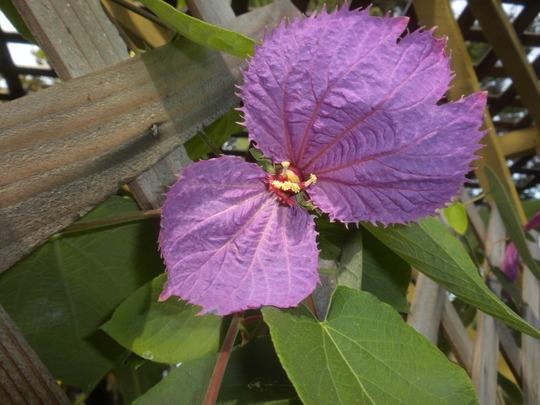 This photo is of species Dalechampia dioscoreifolia - Purple Wings Vine.